Using mindfulness to picture your perfect Friday—and put it into practice. When we’re at work—especially on a Friday—home is not far from our minds. We yearn for some down time, and the relaxation that comes from being with friends, family, or just resting by ourselves. But as the work day comes to an end, maybe we get stuck in rush-hour traffic, or we have to run a few errands that take more time than we’d like, and that picture-perfect Friday starts to dissipate. We arrive at our doorstep exhausted and irritated, and another night seems to fly by without us really noticing. Bringing mindfulness to this experience can help us savor and appreciate the final hours of the day. You made it through the week, and you deserve a happy hour (or three!). Bring these three mindful tips home with you and see what you notice. 1. Set your intention: Before you even step foot in the door, take a deep breath, soften your body as a way of becoming present, and take some time to think about how you want this evening to unfold. Do you want to spend time with your family? Do you want to relax in another way? 2. Hug something: It could be an animal, a loved one, or if there’s no one else there, curl up in a ball and hug yourself. Hugging allows us to feel connected, soothes the body, and it sets us up to feel good for the rest of the evening. 3. Control your environment: Put on some soothing or playful music, bring some play into your environment, or put on some candles if you want it to be a relaxing evening. Elisha Goldstein, Ph.D. is hosting an online course to help people fully integrate mindfulness into their lives in a deep way in order to realize more enduring change. 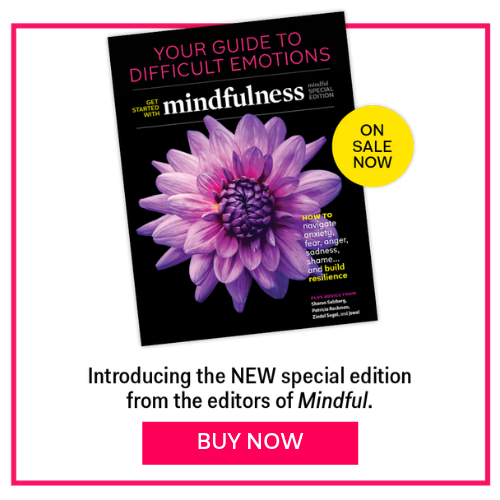 The in-depth 6-month online course called Course in Mindful Living runs this September. Sign up now to join a community of people growing in confidence, calm, compassion and a life you love.